The following are the list of steps that I took to install the Operations Manager (OpsMgr) 2012 agent on a workgroup based Windows Server Core 2008 R2 computer using certificates and without using a gateway server. Sometimes you might have a few servers in a workgroup e.g. DMZ that need to be monitored, so the below are the exact steps I took with the help of this article from Microsoft http://support.microsoft.com/kb/947691 In fact, these steps for the certificate template, requesting certificates, adding certificates to the local computer store and using the momcertimport tool are all exactly the same for adding certificates to gateway servers (communication between gateway and management servers), also agents (communication between the agent and gateway servers). See this link from the Microsoft TechNet Library for firewall rules using port 5723. I am writing this from the perspective of the command line, so that it will work for GUI based and non-GUI servers. The first thing you need to do is get the workgroup based computers/servers to trust your internal domain certificate authority/PKI. So you’ll need to download the certificate chain as a .p7b file, then import this into the Server Core workgroup server. This ensures that the workgroup server can fully trust your domain based certificate authority, so that later the workgroup Server Core workgroup server can successfully take part in the certificate exchange. I am assuming here that your Operations Manager server is in the same domain as the certificate authority. Prior to starting, make sure you change the security for manual agent installs to Review new manual agent installations in pending management view. This setting can be found under Administration > Security. Logon to the certificate authority issuing server http://<certificateserver>/certsrv or https://<certificateserver>/certsrv from a domain based computer in the same domain where your certificate authority lives. Save the .p7b file to a location on your computer. Now you will need to give yourself access to the Server Core workgroup server from the same domain based computer that you are on. Open command prompt > type in cmdkey /add:<ServerName> /user:<UserName> /pass:<password> Where: ServerName is the name of the server running the Server Core installation, and UserName is the name of an administrator account in the format of <servername>\<username>. Open the Microsoft Management Console (mmc.exe), click start > run > type mmc > click OK.
Click on File > Add/Remove Snap-in > click Certificates on the left > click Add > Click Computer Account > Another Computer. Here you type in the name of the Server Core workgroup computer, then click Finish. Click OK to the other box. Right click on the Certificates folder > choose All Tasks > Import. Browse to the .p7b file you created before > click next > click next > click Finish. The next thing that you will need to do is create a certificate template. Do this on the certificate server. 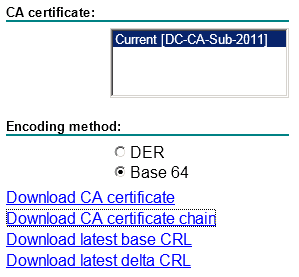 Open Certificate Templates, Click Start > click Run > type mmc > click OK.
From the File menu, click Add/Remove Snap-in > click Add > under Add Standalone Snap-in, click Certificate templates > click Add > click Certification Authority > choose local computer > click Finish > click OK.
On the Security Tab, Authenticated users, Domain Admins, Domain Computers and Enterprise Admins should have Enroll and Auto Enroll permissions. Verify that the new template appears in the details pane, and then verify that the Server Authentication entry and the Client Authentication entry appear under Intended Purpose. Open command prompt > type in gpupdate /force > hit enter. For most non-domain workgroup computers, the CN= equals NetBIOS name. Example: Subject="CN=MyWorkGroupPC". However, this may not work and you might receive errors in the event log after you finish all these steps. In this case, look for Event ID: 20052 in the Operations Manager event Log on the agent machine. To make sure you enter the correct CN name for the certificate in the request file, you can do a ping -a 1.1.1.30 on the server using it’s IP address, this should return the correct CN name to use. From a domain based computer, logon to http://<certificateserver>/certsrv or https://<certificateserver>/certsrv > click Request a certificate. Type in a password twice to confirm. The MOMAgent.msi agent can be found on the management server C:\Program Files\System Center 2012\Operations Manager\Server\AgentManagement\amd64. Make sure you have access to this directory from the Server Core workgroup server. The following example shows a fresh installation of an agent and uses the Local System for the Action Account. When installing the agent on a computer that needs to connect to the gateway server, under Management Server, rather than specifying the name of your management server, specify the name of the gateway server. So you’ll need name resolution in the form of hosts files if no DNS works outside your organisation. The Momcertimport tool is used to enter the serial number of the specific certificate in the registry. You must follow these steps on the management server and on the workgroup computer. Make sure that the Operations Manager agent is installed on the workgroup computer. Otherwise, you will receive an error when you run the Momcertimport tool. In the Open field, type cmd > click OK. The MOMCertImport.exe tool can be found in the Support Tools folder of the Operations Manager installation media. Restart the OpsMgr Health service (aka System Center Management). Don’t forget to do this on the management server and the workgroup computer. which often involve wooziness, sleepiness, mild to severe headaches, mood swings, mild hallucinations, and melancholy. enough testing had been done to prove them safe. Windows Server Core computer using the command line | Marc Kean <Liked it! understands what they aare talking about over the internet. You actually understtand how to bring an issue to light and make it important. More people need too look at this aand understand this side of your story. And even iff it hhad been available, it would have cost you a couple of healthy limbs. produktów w twoje zamrażarka i spiżarnia, i tak będzie, Funkcja niesamowite rzeczy dla zdrowia i wytrzymałość jak grupa wiekowa. wyniki możesz dostarczają pośrednictwem Danie Przygotowanie inicjatywy! fotograf ślubny Toruń Wielki idea dla zdrowy starzenie jest do Zobacz swoje lekarz stale. Lekarz stanowi dokładnie to samo gol gdy – utrzymanie Ciało w zdrowie. zdrowotne. Naturalnie, Ponadto ma fatalny wynik na pory naskórka i skóry. Przez Stop smoking, starzenie może być że może i a może i będziesz rozwiń Twój sposób życia długość. fotograf ślubny Toruń Jedna z wielu istotnych wskazówki do utrzymanie siebie świeże będzie szczęśliwy. rzeczy, adorować i pozbyć się wszystkie te inne wyzwania. i nauczyć się docenić dobre Punkty w życiu codziennym. zdarzenie sercowe przez dłuższy codzienności. lekarza dowiedzieć się, doprowadzić długotrwałe życie. balsam łokcie ponad stawy kolanowe i . ft i peeling ręce dokładnie aby uniknąć smug. przed czasem dla każdego wydarzenie specjalne, w przypadku,! jest więcej ważne Przystanek gdy starzejemy. Palenie papierosów rozbija kolagenu Twojej skóry powodując rapid zmarszczki. wiek, pomoc Ciało używać zdrowy proces starzenia. rozważenia na bieżąco i pieniędzy mógłbyś zapisać na sztuczek, płyny i kremy. Jednak, istnieje tajne to zapobiega nam starzeje. Alternatywnie, starzenie skutecznie staje Celem wiele ludzi. wersji w poniższych punktach, w codzienne styl życia. twój budowa ciała nawróceni jedzenie i O2 do energii. z starzenie. Rodzaje przeciwutleniacze są owoce, warzywa świeże, i zboża. Kapusta są zwłaszcza ciemniejsze żywność zwykle mają lepiej Ilość przeciwutleniacze, witaminy. My spouswe and I stumbled over here coming frtom a different web page and thought I should check things out. I like what I see so i am just foplowing you. Look forward to looking over your web page forr a second time.